‘From The Laboratory To Leadership’ program begins on May 15th in Seattle! Don’t miss your opportunity and reserve your spot today; limited to 20 participants. Gaylene Xanthopoulos has been recognized as one of the top thought leaders and influencers in the biotech community and has been invited to attend and present at this exclusive event. This invitation-only event is limited to 40-60 biotech CEOs who are viewed as thought leaders and influencers in their local and/or national biotech communities. The event will focus on refining the crucial skills and enhancing the knowledge base that today’s biotech leaders require to deliver on the promise of transformational science. Now in its third year, the Biotech CEO Summit Napa is a private, thought-provoking meeting that brings together biotech industry leaders like Gaylene in a venue where they can talk candidly with their peers about the opportunities and challenges facing their organizations and the industry as a whole. The Leadership Edge is pleased to be a partner and presenter at LABioStart. Camille Primm will present Your Leadership Edge. This 5-week boot camp is an intensive training program for bioscience entrepreneurs in the early stages of their ventures. Cal State LA, Biocom and the Los Angeles Cleantech Incubator developed the program to meet a critical need in the Los Angeles region: to provide founders of bioscience startups with the industry-specific business training to turn scientific ideas into successful commercial ventures that will drive long-term economic and employment growth. The boot camp addresses the challenges most common to scientists and new entrepreneurs seeking to turn their scientific discoveries into successful companies. Seasoned business professionals will also benefit from lessons in bioscience-specific topics such as FDA-regulated development, manufacturing and quality control processes. Wally Kuhns has been selected to be a panelist for this live webinar. You can watch it live by clicking here. It’s an incredibly exciting time for the life science industry. Today, more than ever, our clients have drug candidates entering late stages of development. We are celebrating the approvals of their innovative drugs and supporting them as they begin to commercialize these products in the market. The life science industry remains complex as access to capital continues to be challenging, global partnering relationships are established, and some companies adopt a virtual model. This fast-paced and ever-changing environment has provided us with an outstanding opportunity to redevelop our From the Laboratory to Leadership program, building of 25 years of success with over 5,000 graduates from over 500 life science companies. This fully redesigned program continues to turn science-minded first-time managers, as well as managers seeking to expand their management skills, into capable business leaders. We accomplish this by leveraging our extensive industry-specific knowledge and experience to utilize the most progressive and engaging professional development methods available. From the Laboratory to Leadership begins by helping participants assess who they are as leaders – their strengths, styles, and personal brand. From there, we develop skills in the areas of communication, emotional intelligence, priority management, meeting management, goal setting and planning, delegation, performance management, and leading teams in a dynamic workplace. We wrap up the program with a highly interactive simulation that brings all the learning together in a fun and impactful way. To drive high levels of engagement and impact, this program integrates learning pods, utilizes technology to measure progress and support a variety of learning styles, encourages participants to use their companies as learning labs, and helps clients set goals that deliver measurable results. Leveraging Your Leadership takes your experienced managers to the next level. So they’ll not only have core management skills, they’ll have the core leadership skills to drive strategic results for your company. This three-day program, full of personal insights and practical solutions, is custom designed for life-sciences managers in leadership roles. The class size is limited to 20 participants, ensuring maximum support and coaching. Strong leadership drives strong performance. After all, the more capable and aligned your leadership, the more likely your organization will reach the next milestone, get the next round of funding, and succeed in the marketplace. From the Laboratory to Leadership – New Dates Just Released! Biocom is hosting their 8th annual Life Science HR Conference in San Diego on October 18th and 19th. This strategic-level conference is dedicated to professional executives in the life science human resource/organizational development industry. The objective of this conference is to provide a unique opportunity for attendees to engage and learn from thought leaders like Gaylene Xanthopoulos, who are experts in the field of Human Resources and/or the Life Sciences. Her presentation is on Building a Better Business Case: How to Utilize Data to Persuade Your Executive Team. Gaylene Xanthopoulos has a passion for assisting people to reach their highest potential. She is founder and president of The Leadership Edge, the organizational development partner of choice for over 500 Life Science companies. She holds a Bachelor of Science degree in Economics from the Wharton School of Business at the University of Pennsylvania, Philadelphia, Pennsylvania and she is certified in a number of learning and development assessments including the Myers-Briggs Type Indicator, Executive Dimensions, PDI 360 feedback tool and SurveyOnline 360 feedback tool. Her personal accomplishments include being awarded Athena San Diego’s 2013 Pinnacle Award in the category “Individual in Services” for her role in the development and advancement of skilled and talented women within the San Diego community, “World Sales Leader of the Year” by Leadership Management, Inc. two years in a row, being named a winner of the San Diego Business Journal’s “Business Management Award” in their Women Who Mean Business competition; and in the following year, the San Diego Business Journal also named her company as one of the “Top 50 Companies in San Diego”. Gaylene is an in-demand speaker and keynoter for national and international business conferences, as well as a published author. This conference is dedicated to professional executives in the life science human resource/organizational development industry. The objective of this conference is to provide a unique opportunity for attendees to engage and learn from thought leaders like Amy Bergen that are experts in the field of Human Resources and/or Life Sciences, along with creating an open dialogue amongst peers. These dates are sold out, but we have opened up another program that begins on 9/29 so please register for that program. This strategic-level conference is dedicated to professional executives in the life science human resource/organizational development industry. The objective of this conference is to provide a unique opportunity for attendees to engage and learn from thought leaders like Beau Donegan that are experts in the field of Human Resources and/or Life Sciences, along with creating an open dialogue amongst peers. Beau has extensive experience in human resources and as an executive, and works with many of our executive and leadership teams, particularly during times of change or transition. Leveraging her wealth of knowledge and experience, she also leads custom programs at the most senior levels. Beau’s keen wit combined with her pragmatic approach, makes every session she leads fun and impactful. We are pleased to have been selected as an expert in our field and be presenting at The LA BioStart Bioscience Entrepreneurs Boot Camp (BEBC). This program is sold out but we will be having another program in 2018, so please register below to be on our waitlist and to learn about our upcoming dates. It’s an incredibly exciting time for the life science industry. Today, more than ever, our clients have drug candidates entering late stages of development. We are celebrating the approvals of their innovative drugs and supporting them as they begin to commercialize these products in the market. The life science industry remains complex as access to capital continues to be challenging, global partnering relationships are established, and some companies adopt a virtual model. This fast-paced and ever-changing environment has provided us with an outstanding opportunity to redevelop our From the Laboratory to Leadership program, building off of 25 years of success with over 5,000 graduates from over 500 life science companies. This fully redesigned program continues to turn science-minded first-time managers, as well as managers seeking to expand their management skills, into capable business leaders. We accomplish this by leveraging our extensive industry-specific knowledge and experience to utilize the most progressive and engaging professional development methods available. Forging a successful career path requires clarity, courage, strength, and negotiation. In today’s rapidly changing world of work, the idea of the traditional career ladder is near extinction. Effective career navigation is now thought of as a mosaic of intentional experiences that foster learning, development, visibility, and professional fulfillment. Seeking career development opportunities both internally and externally will not only help you get to your ideal role but can simultaneously maximize your impact on the organization. Join us for an engaging session lead by Amy Bergen, Vice President of Business Development at The Leadership Edge, where we will explore how identifying your skills and talents, and combining these with your goals and aspirations, can map your path for long-term success. 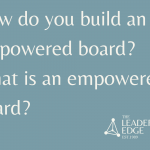 The Leadership Edge is passionate about creating a more robust pipeline of female leaders within the life sciences and supporting gender diversity at the executive and board levels. 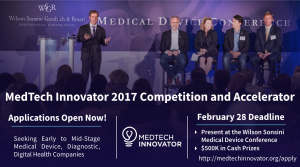 Over the past three decades, they have had the unique privilege of working with over 5,000 board members, executives, and scientific leaders to dramatically improve the performance, pace, and culture of the most dynamic and innovative pharmaceutical, biotech and medical device companies in the country. Female leaders bring unique perspectives, skills, and competencies to the workplace. They also have unique challenges and professional development needs. 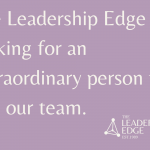 The Leadership Edge recognizes this and has recently expanded their development offerings to include a new Leadership EDGE for Women program to address the greatest needs and challenges faced by both emerging and existing female leaders today. Amy Bergen has dedicated the last decade of her career to supporting leaders in life sciences. As Vice President of Business Development for The Leadership Edge, Amy expertly connects life science organizations to professional development for their managers, leaders, and teams. With nearly three decades of experience empowering over 5,000 executives to reach their highest leadership potential, The Leadership Edge has proven to be an invaluable resource to the life science community. Amy has been instrumental in creating a new program, Leadership EDGE for Women, which was designed to create a more robust pipeline of female leaders within the industry and support gender diversity at the executive and board levels. 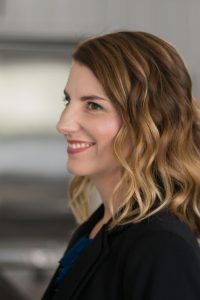 Prior to joining The Leadership Edge, Amy served as the Executive Director of Athena, where she was instrumental in the organization’s successful transition from UCSD to an independent nonprofit organization. Through rich and diverse programming, mentoring, and networking, she connected over 500 dynamic women seeking advancement opportunities in life sciences and technology. Through wide-ranging relationships and partnerships, she recruited 300+ executives to lead voluntary, yet critical, roles for the organization including the Board of Directors, committee chairs and members, mentors, facilitators, and speakers. Each of these opportunities provided valuable leadership development for aspiring and established female leaders. Amy was also a key driver of initiating a new one-on-one mentoring program, a unique offering designed to foster meaningful connections and valuable career advancement. * – Walk-ins will be accepted at the door until event capacity is reached. Recommended as the follow-up to From Laboratory to Leadership, this program takes your experienced managers to the next level by taking a deep dive into visioning and influence skills, thinking strategically, inspiring creativity, creating a culture shift, decision making, problem solving, and leading in a matrix team structure. Participants will come away with core leadership skills to drive strategic results for your company. 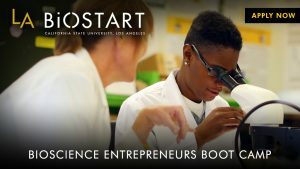 The LA BioStart Bioscience Entrepreneurs Boot Camp is a five-week, intensive training program pairing emerging bioscience entrepreneurs with industry experts and executives for training in business fundamentals, bioscience knowledge, and leadership skills. The courses will be held at Cal State LA, a few miles from downtown Los Angeles, and at the Los Angeles Cleantech Incubator (LACI)’s La Kretz Innovation Campus in the downtown Arts District. The boot camp is a partnership between Cal State LA, the Biocom Institute, and LACI. Camille Primm from The Leadership Edge has been selected to facilitate the leadership portion of this program on August 1st and 2nd. Upon successful completion of the boot camp, participants will receive a year-long membership to the Biocom Institute. This program is limited to 20 participants and often sells out. Facilitator: Lisa K. Tesvich Ph.D. Recommended as the follow-up to From Laboratory to Leadership, this program takes your experienced managers to the next level by taking a deep dive into visioning and influence skills, thinking strategically, inspiring creativity, creating a culture shift, decision making, problem-solving, and leading in a matrix team structure. Participants will come away with core leadership skills to drive strategic results for your company. Register here to be added to our waitlist.